I’ve now made a couple of CLE presentations using the EDBP.com models. 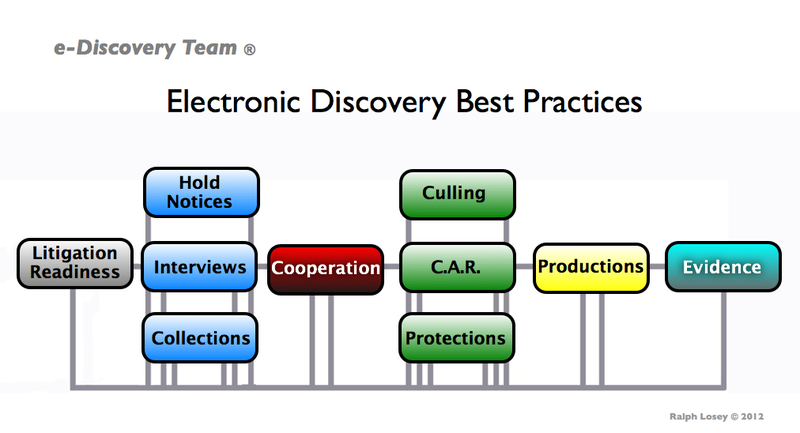 If attorneys have not seen the EDRM model before, they seem to understand the EDBP diagram right away. Advanced practitioners also get it right away, and most are delighted to have a new approach. However, I still ran into a number of different attorneys who were inexperienced and had only partial knowledge of EDRM, and they seemed to have some mental difficulty getting their head around the new approach. 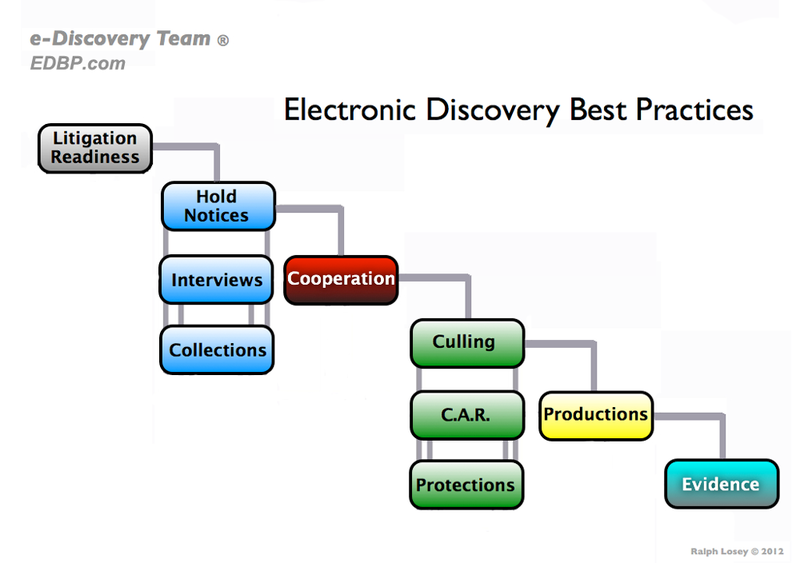 It helped when I explained that the new model only describes the activities of an electronic discovery lawyer, not the overall process. It is not designed to replace the EDRM, just to supplement it and provide a lawyer-centric model. By the way, all of these EDBP charts you see on this page are freely available to everyone, so long as you do not change anything significant without my permission. We expect to create a number of different styles for this ten-fold flowchart, and encourage others to create their own, again just so long as you do not change the basic structure without my permission. If you use it online we would also appreciate a link back to EDBP.com, but that is not required. If you would like a higher quality versions for large-scale blow-ups, just let me know, and we will FTP you a copy. The purpose of the new diagram is to provide a convenient structure to organize a collection of attorney best practices. The model in effect provides the bones for a new body of law to be fleshed out in the coming years by attorneys specializing in e-discovery law. It is a practice oriented guide by and for attorneys. The EDBP will change and evolve as attorney best practices change and evolve. Even the structure itself, the ten-fold workflow model, may change with the times. It is all open for growth and improvement, just the like the practice of law itself. All attorneys and paralegals are invited to contribute to this new and open project. You can do so either by private email suggestions to me at ralph.losey@gmail.com or by public comments at the bottom of each page of EDBP.com. We have already received several good comments and suggestions for best practices to add to the EDBP and have done so. It grows slowly but surely, as designed and intended. This is a collaborative process by and for attorneys and their team, both in-house counsel and outside attorneys. It is relatively painless to make a contribution, and you can do so anonymously if you wish. You can either leave a comment at the bottom of any page of the EDBP.com website, or send me an email. In an attempt to encourage you to participate I am going to conclude this blog by sharing just one of many fine contributions that have already been made. 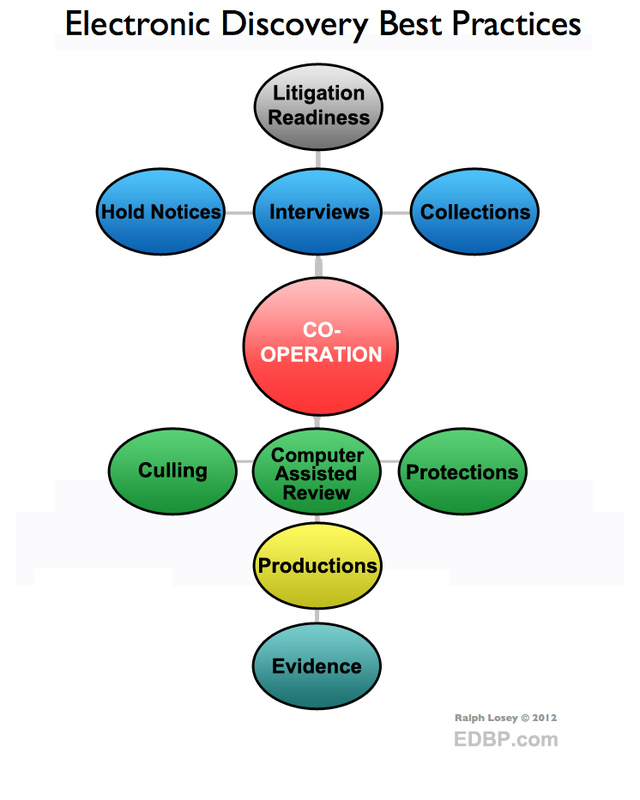 This should give you a better idea of how the process works, and at the same time give you our thoughts on the key lawyer function of Interviews, a central step in ESI preservation, not to mention trial preparation in general. We are always open to suggestions on how to improve EDBP or the collaborative process. We already have a few process type changes in mind that I will share next month after we try them out. This is the ground floor my fellow attorneys, get in while the gettings’ good. The full name of this contributor has been withheld at his request. If you want to take credit for any suggestion you make, we are happy to provide full attributions. Note our site includes multiple disclaimers that the information is provided for educational purposes only and is not intended to be legal advice, etc. So too does this blog. SUGGESTION FROM JAMES Q. (attorney in private practice) (comments slightly edited): Having no idea how this information will be incorporated, here is an opening salvo. Here are two frameworks for getting the hold discussion started. The first is designed for counsel interacting with a client on a new matter; getting up to speed. The second works more to guide an attorney through the discussion regarding trigger, scope, and how to implement. A. Should a legal hold be in place? B. Is a legal hold in place? 3. Proactive preservation steps. Was the hold, spoliation, locations of evidence discussed at a board meeting and are minutes available. If so, date of meeting and contact information for custodian of minutes. c. Have documents been destroyed since implementation of the hold? d. Were documents destroyed before the hold was implemented, but after it should have been triggered? d. Combined or aggregate knowledge of the employees of the company or its agents. a. Who needs to get the hold notice? b. How will you be sure they got it? EDITOR’S COMMENTS AND RESPONSE: Jim’s comments were first left on the home page of EDBP. Since they pertained to best practices gathered on the Preservation Page of the EDBP, we moved his comments to that location. If you are unsure to which section your comment goes, leave on this first page as Jim did and we will move it. If you know which page your input pertains to, please leave the comment on that page. We decided to plug Jim’s good suggestions into Interviews, as the beginning of a client representative interview. We also made a few tweaks and additions to what you saw above, such as clarifying that oral notice alone is never a best practice (although it may meet minimum standards in some circumstances). It is included as a linked attachment to the EDBP page. We will expand upon this outline, and prepare and attach other outlines of witness interviews in the coming months. When we gather more information on this key module, step number three of the EDBP, we will set up a separate page for Interviews. Right now steps two, three and four are all combined together on one page, the Preservation Page. By the way, anyone care to guess why we felt that the color blue was appropriate for the three preservation steps, Hold Notices, Interviews and Collections? It was not an arbitrary decision, but rather legal history and law firm tradition derived. Questioning people, Q &A, are a key part of what all lawyers do. 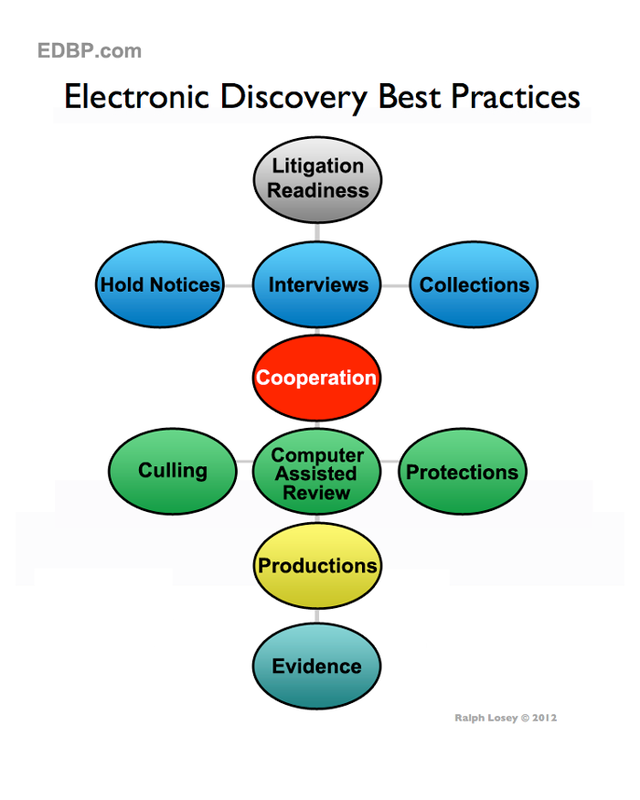 Electronic discovery lawyers are no exception. Any e-discovery lawyer, both outside counsel and in-house, is invited to contribute to EDBP by sending in more client or witness interview suggestions. We think that reference to detailed, exhaustive outlines for interviews, including formal interviews, i.e. depositions, are a best practice, so long as you are not wed to the outline. You must have the skill and knowledge to customize and add to the outlines to fit the facts and case issues. Generally EDBP will not be sharing forms like this for a variety of reasons, including primarily the fact that it is rarely, if ever, a best practice in electronic discovery to rely on forms. But, when it comes to interviews we think that an outline list, which is a type of form, is an exception to the rule. Even the world’s most experienced surgeons, who have performed a particular type of operation hundreds of times, still go into an operating room with a check list. Any lawyer should too before they begin an interview or deposition. We anticipate outlines for interviews with custodians, other witnesses, and client representatives, such as in-house counsel, even though they are not custodians or witnesses, or at least may not be custodians or witnesses. This was Jim’s important first contribution. We listened and because of his input expanded the Interviews module, step three, to include interviews not only of ESI custodians, and other witness, but also interviews of the client. Still, we anticipate that the main focus here will be on outlines for interviews of the custodians and other fact witnesses. There are many different types of witnesses and for that reason various types of question outlines are appropriate. We anticipate having different outlines for witness with varying job functions, whether employed by your client or not, whether storing potentially relevant ESI of not, whether friendly or hostile, and, of course their roles in the controversy. There will also be different versions of outlines according to the levels of importance of the witness. For instance, the interview of a key custodian should be much more exhaustive than a minor player, and thus the outline much more lengthy. After interview outlines are further developed, we expect that lawyers will be able to pick and choose which outlines and bullet points are appropriate for the case, the particular types of disputes, witnesses, and clients. 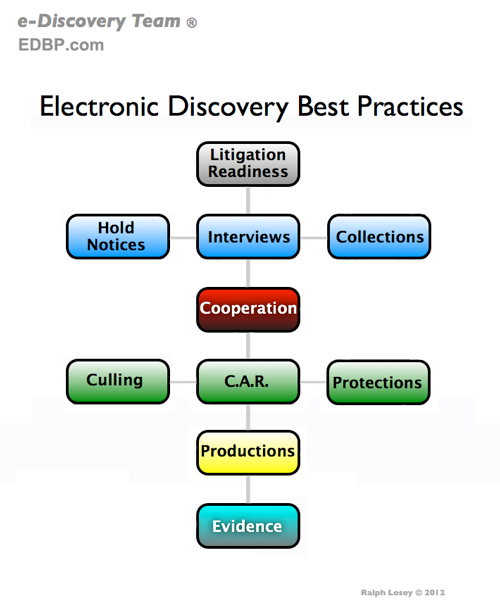 Many in the profession think, like I do, that it is important to provide practicing attorneys with a resource where they can find a clear, easy to follow reference to the latest best practices in electronic discovery. These are not minimum standards, things that are just good enough to get by, to avoid malpractice. These are best practices to strive for, practices that might not be appropriate for every case and court. Rule One of the FRCP, which requires the just, speedy and inexpensive handling of any civil lawsuit, always remains the prime directive. Constant awareness of the impact of Rule One is in itself a best practice. 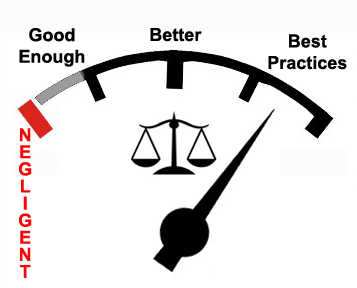 If you are striving to follow best practices, you are miles above and ahead of the bare minimum standards. This in itself is the surest protection from professional malpractice. 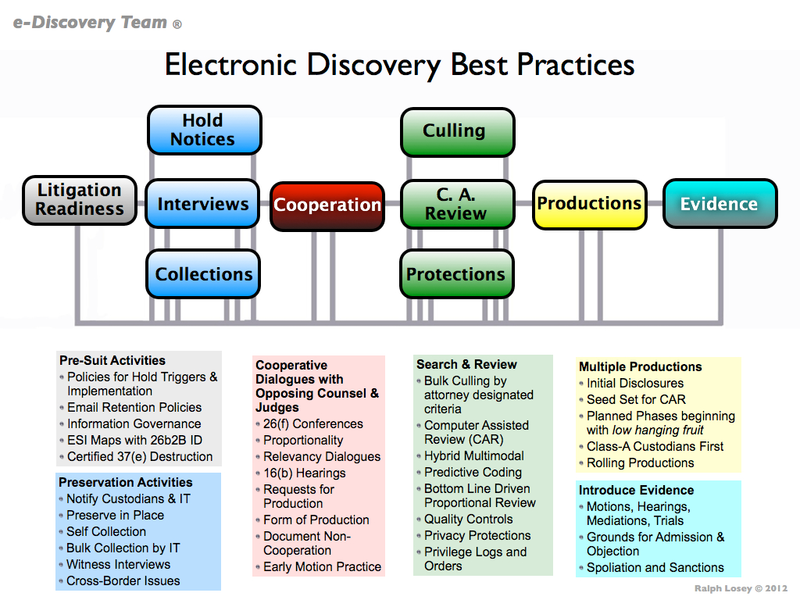 Electronic Discovery Best Practices, EDBP.com, will do its best to create a central clearing house for these practices. Check out what we have accomplished so far by going to EDBP and browsing around. You will not only see my thoughts, but those of many other attorneys and legal groups. I try to study them all. After browsing, please help out by taking the time to send any comments you may have or proposed additions or revisions. 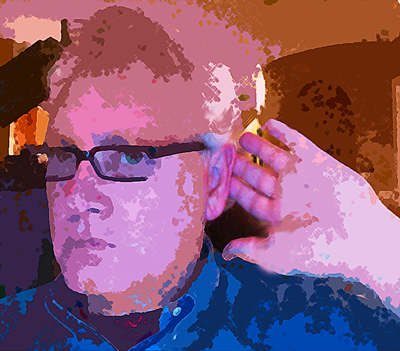 I’m listening, and I’m all ears, well, almost. This entry was posted on Sunday, November 18th, 2012 at 12:07 pm and is filed under Evidence, Forensic Exam, Lawyers Duties, Metadata, New Rules, Related Legal Webs, Review, Search, Spoliation/Sanctions, Technology. You can follow any responses to this entry through the RSS 2.0 feed. Both comments and pings are currently closed. 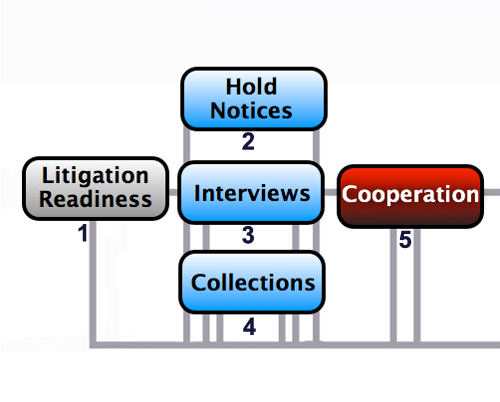 Ralph — I am not certain where this would fit in exactly, given it is a cross between the “blue” tasks of litigation readiness and the red cooperation phase, but I always recommend as very soon as possible — whether dealing with opposing counsel in civil litigation or with government attorneys in an investigation setting — trying to negotiate immediately (and before negotiating anything else) an agreement allowing the client to return to regular-course back-up tape rotation, as well as an agreement that voice-mails either do not have to be collected or that on a going forward basis they will not be part of the document corpus for purposes of discovery. I do this because in our practice we have found that if back-up tape rotation is not addressed right away, the client can spend months and months retaining back-up tapes (and buying new ones) simply because no one yet has bothered to talk about an agreed protocol –which leaves the client in retention limbo with no option but to save and save. As to phone messages –although some clients may have a system where the voicemails are retained along with their emails (and can be produced in native format), many others simply have a system that purges the voice mails after a certain volume has been reached or 30 days have passed, etc. While we have developed various “solutions” — such as having a special phone number set up where all relevant phone messages can be forwarded and held indefinately –none seems to be very ideal or particularly satisfactory. Moreover, because there is no automatic transcript of voice mails, the only way to review is to listen to the messages — and then develop an agreement for production — e.g., supplying a transcript (which costs a lot to do) or agree to supply the messages as audio recordings — which leaves the receiving party with the same problem — i.e., how to review. Bottom line –I try to get these voice mail messages off the table ASAP when a matter gets going and before anything else is negotiated. So, I consider these two things — back-up tape retention and voice mails as things to address even before the full cooperation phase. Food for thought . . .